12, 18, 24, 30, 36, 48 and 60 inches. The diameter is 4+ inches. Max Grow slit tube design was the first such design to address and solve a major problem caused by tree shelters. In 1989, Tom Mills, founder and president of Tree Pro, was doing some consulting work for American Forestry Technology, Inc., of West Lafayette, Indiana. At that time American Forestry was the sole source for the genetically improved black walnut varieties developed and patented by Purdue University. Eager to protect these valuable cultivars, American Forestry installed thousands of tree shelters, which at the time was a brand new device imported from Europe. A few months later 74 percent of American Forestry's seedlings were dead. Tom Mills analyzed the problem and determined that excessive heat retention inside the protector was the most likely cause of the fatalities. He proceeded to experiment with various tree protection designs. Eventually, he invented a design that solved the heat-retention problem. He subsequently founded Tree Pro and began manufacturing a tree protector, dubbed Tree Pro. The slit tube eliminated the problem by allowing tree planters to open the protector up in the fall of the year to allow trees to go dormant. Even though that's still an option, it is no longer necessary in all but the most extreme cases, thanks to venting. Max Grow is the most versatile design in the industry. Because it can be expanded to achieve larger diameters, there is almost no limit to the size of tree or plant it can protect. They have, in fact, been used to protect evergreens, grape vines, strawberry and blueberry plants, and even tomato plants. Because Max Grow can be easily removed, they can be reused elsewhere once they've done their job, a significant cost advantage over tubes. 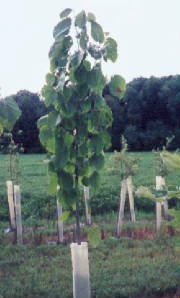 Because they can be opened up, it's easier to perform maintenance on the tree (e.g., removal of weeds, pruning, etc.). For this same reason, during extreme hot spells, you don't have to worry about your tree being cooked. You simply open the protector to allow fresh air to circulate around the tree. Max Grow can be supplied vented or unvented. Vented tree protectors enable the circulation of fresh air through the holes in its wall while at the same time preserving most of the moisture around the tree. Tree planters in most areas of the country benefit from using vented protectors. Unvented protectors are used in more arid climates where preserving moisture is crucial. Max Grow save time later because it is easy to open the tube to service the tree. Max Grow Tube A SLIT TUBE DESIGN FOR EASY INSTALLATION AND REMOVAL. ¨ Life - 6 to 8 years. ¨ 3 ties provided with taller tubes. ¨ Slit design does not require a laser line. ¨ Made in the USA of 100% recycled materials. ¨ 4”+ diameter to optimize growth and survival. ¨ Designed to support a stake the length of the tube. ¨ Vented to allow the plant to properly harden off or dry out in moist climates. ¨ Panel Design. 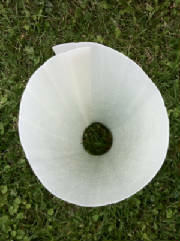 One panel makes a 4” diameter tube. Two panel make a 8” dia.